Fantabulous Cricut Challenge this week is a hot chocolate/cup theme or to simply use brown. Cricut cuts - gumboots (Paisley), spade (Paper dolls), font (Life's a Beach). Great layout! 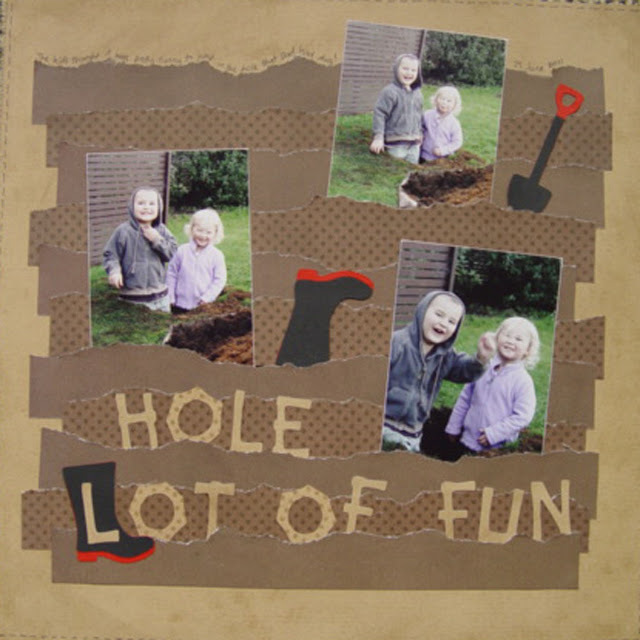 Love the tearing of the paper and cute little shovel and boot cut! Adorable pic's of your kiddo's. Thanks for joining the challenge at FCCB! Boy they sure look clean to have been playing in the dirt! I love that upside down boot, your LO is really cute! What a great LO!! I love the play on words and those pics are wonderful!! Great memories!! Very cute layout! Thanks for joining us at FCCB! Great use of the torn edge across all the elements of your layout! What fun those kids are having too, such a story to tell there!